Laurie Kingery here. For my blog post this month, I thought it might be interesting to discuss a religious ritual that used to be practiced by several Plains Indian tribes such as the Sioux, Arapaho, and Cheyenne, the Sun Dance. This is a ceremony in which young men dance around a pole which they are attached to by rawhide thongs attached to pegs that pierce the skin of the chest as a sacrifice for the good of the tribe. This was not a ceremony that was done casually, or open to nontribal members to witness. The words used are in the tribal language and not translated. Those who know about the ceremony generally do not speak of it out of a desire not to have the ritual corrupted. Out of respect for native Americans, I am not including pictures of the dance, though it is certainly possible to Google them if you are interested. 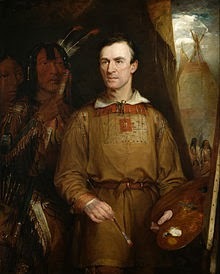 The famous artist of the west, George Catlin, sketched it in the nineteenth century. The name Sun dance comes from the Sioux identification of it as the Wi wanyang wacipi, or "Sun-Gazing Dance." The Indians made a hocoka, or ritual circle, with the sacred cottonwood tree erected in the center and an arbor around the perimeter of the circle, except for an entrance at the east where the dancers entered. The cottonwood was felt to be sacred because its leaves are shaped in the conical pattern of the tipi, and if one cuts an upper limb crosswise, inside will be a five-pointed star. The cottonwood tree selected for the ritual is found by a scout, and at evening, those involved in the ceremony go to the tree and pray. Those who will cut down the tree stand at points north, south, east and west of the tree. The tree is never allowed to touch the ground on the way to the site. Bundles of sage and tobacco are tied to the top of the tree to represent the prayers of the people, and the tree is brought into the circle from the west. The setting was a ritual way of making a local place sacred to renew the people's relationship with the land and with all the beings in their lives, human and otherwise. The dancers fasted before and during the ceremony, and a camp was set up around the cottonwood tree that had been erected in the center of the circle. The ceremony was held in the summer during a full moon. Elders of the tribe conducted the ceremony, which usually took place over three days. On the third day the skin of the dancers is pierced by the tribe's medicine man. The dancers lie down together to have their chests pierced. Not all tribes pierce the skin for the sun dance; one source I read said that only the Sioux do, but that they do it for the entire native American population. Heyoka, or sacred clowns, come out to join the dance on the third day and raise the dancers' spirits. The clowns dance counter-clockwise instead of clockwise as the dancers do, and wear black and white. Traditionally, the dancers dance toward and away from the tree three times, then yank back as hard as they can, breaking the skin where the pegs are. The skin is then cut off and placed at the base of the tree, symbolizing the dancer's sacrifice. At dusk on the third day, there is a great feast. The sun dance was once outlawed by the governments of the U.S. and Canada, but was once again made legal in 1951 in Canada and in the U.S. in 1978 by the passage of the American Indian Religious Freedom Act. It still takes place, though how often is not known. A writer I have met who is married to a native American had a son who took part in it. Next month on my blog date of 4/19, I will be giving away a copy of my latest book, THE PREACHER'S BRIDE CLAIM, the first book in the Love Inspired Historical's Bridegroom Brothers continuity series, so I hope you will join me again then. Thank you for sharing this very interesting post, Laurie. Meanie, thanks for being such a faithful reader and commenter! I'm glad you found it interesting. Thank you for the post. I have heard of this before and had no idea it is still practiced . It would indeed take bravery to participate. More bravery than I have, for sure! Thanks for commenting, Jackie. 2 of our kids are arapaho cheyenne and when they were young our neighbors would insist we go to Pow Wow's (Oklahoma) so they would know their heritage. Lots of fascinating history in your piece. Melody, thanks for commenting. If your kids wanted to participate in a Sun Dance, would you support that? I'm not sure I could stand it. Such fascinating history! I had not heard of such a ritual. Thank you for sharing.